While most advanced economies have displayed significant drops in GDP during the last years, the behavior of labor market variables (employment, unemployment, number of hours) has been quite different across countries. 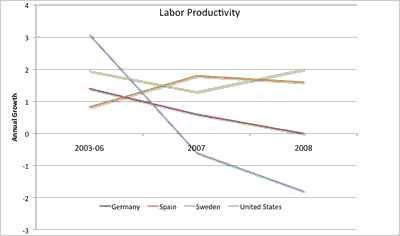 Below is data on labor productivity measured as GDP per hour worked in four countries (data is annual so we are missing the first quarters of 2009). In the case of Sweden and Germany we can see that the fall in GDP has been much larger than the decrease in hours worked leading to a decline in productivity. In the case of the US productivity has remained stable. In the case of Spain the fall in employment and hours has been much larger than the decrease in GDP which has produced a doubling of the productivity growth rates in 2007/08 relative to the 2003-06 period. Antonio Fatás is professor of Economics at INSEAD. He is a Research Fellow at the Centre for Economic and Policy Research in London and has worked as external consultant for international organizations such as the International Monetary Fund, the OECD and the World Bank. He teaches the macroeconomics core course in the MBA program as well as different modules on the global macroeconomic environment in Executive Education. His research is focused on the study of business cycles, fiscal policy and the economics of European integration. His articles appear in academic journals such as the Quarterly Journal of Economics, Journal of Monetary Economics, Journal of Money, Credit and Banking, Journal of Public Economics, Journal of International Economics, Journal of Economic Growth, European Economic Review or Economic Policy. Professor Fatás earned his M.A. and Ph.D. from Harvard University, and M.S. from Universidad de Valencia. GDP Surprise to Have Staying Power?